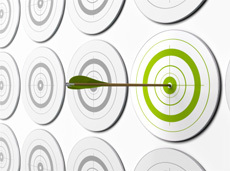 Home Archives Display Retargeting: Are Personalized Ads Better than Generic? Display retargeting gives you an opportunity to stalk follow remind visitors who abandon your site and dynamically personalize the ad to products viewed or keyword intent expressed by the during their visit. Compared to the measly 0.07% average click through rate for display ads, retargeted display ads fare 10x better on average — 0.7% CTR. Common practice is to dynamically merchandise a retargeted ad with products or content viewed during the abandoner’s last visit. While this serves as a very personalized carrot to come back to the site, it’s not necessarily the best way to retarget. Sometimes a generic branded ad is your better choice. 65% agree that when an ad follows me around from one site to another crosses the line from mere customization to invasion of privacy. (Attitudes are more relaxed in Asia Pacific but similar in Europe). Where is the customer in the buying process? Researchers from MIT and London Business School ran an A/B test on a travel booking site, randomly showing either a generic or dynamic (personalized) retargeted ad based on the city viewed. On average, the non-personalized, generic brand ad was more effective. Digging deeper into behavioral data across the site’s advertising network, the researchers discovered users who viewed retargeted ads after visiting a travel review site like TripAdvisor responded positively to both types of ads. Before visiting a travel review site, generic ads outperformed. Visiting a travel review site suggests the user is more likely to have determined a specific destination, rather than be researching travel options. Are personalized ads better than generic? No and yes. Digging through your data, identifying user segments like geography (remember the Adobe study), product category, number of products viewed per visit, frequency of visit, referral source and types of external sites visited can help you formulate effective testing strategies so you can determine which types of ads really drive the most revenue in each context. If your technology supports it, consider testing 3 types of ads: generic, last product / content viewed, and a selection from that category (think “you might like” assortment).